Project managers tasked with delivering safety-critical projects must demonstrate care, competence and confidence right from the earliest stages of project inception, when levels of uncertainty can be very high. 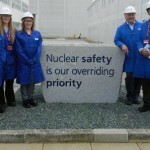 Based on interviews with 30 project management practitioners on nine large-scale safety-critical projects in civil nuclear and aerospace sectors, our latest research (published here in the International Journal of Project Management) presents the Uncertainty Kaleidoscope as a comprehensive framework for identifying project uncertainties. The framework is in the form of a kaleidoscope as a metaphor for understanding project uncertainty. It reflects a key similarity between large-scale projects and the eponymous children’s toy; in that a kaleidoscope can generate a multiplicity, perhaps even an infinite number of distinct landscapes of project uncertainty from the same six determinants – complexity, environment, capability, time, information and individual. New uncertainties may also emerge as the project progresses. This is equivalent to the kaleidoscope being shaken, which may lead to the emergence of a very different project landscape. For example, the archive ‘as built’ drawings of a nuclear reactor may be insufficiently accurate to prevent major new uncertainties emerging during the project to decommission the site and return it to a clean state. Conversely a gas turbine engine on the engine test-bed may deliver test data that does not fit the theoretical models by which the engine has been designed. Many months of work and large additional expenditures may be necessary to correct the engine design and allow it to be certified to fly. These sudden changes in project landscape, often small but on occasion highly consequential, can affect the likelihood of the project objectives being achieved, or may even lead to new project objectives being necessary. Importantly we have also identified which of the six determinants are most prevalent in safety-critical projects; our findings showed that the Environment was the most often mentioned determinant of project uncertainty, followed by Complexity, Capability then Information. The impact of Time on project uncertainty and Individual perceptions of uncertainty were highlighted much less frequently. The Uncertainty Kaleidoscope is the first framework to be developed for the specific context of the safety-critical project and the first to rank the prevalence of the different sources of uncertainty. 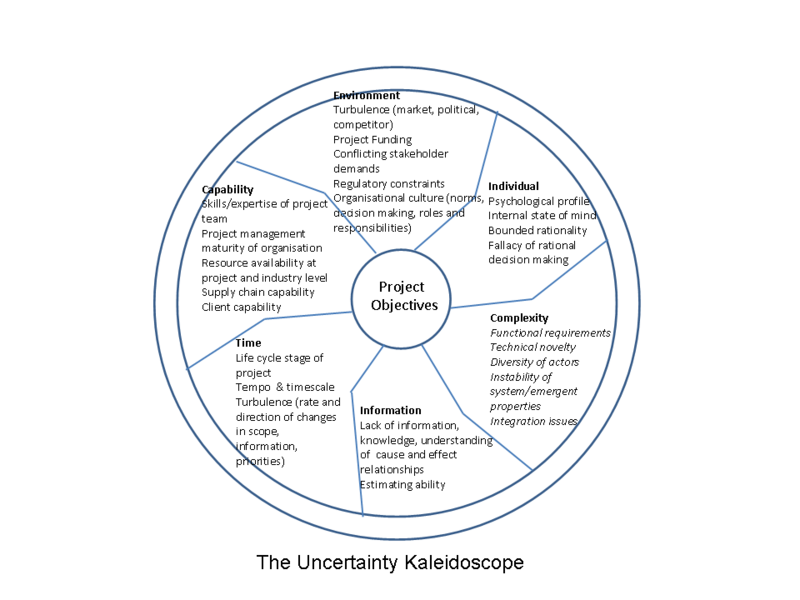 The usefulness of the Uncertainty Kaleidoscope lies not in its predictive power, but as a visual framework to enable project practitioners in safety-critical environments to discuss and debate where uncertainty may reside in projects, before it causes unwelcome surprises within the project team. Like many metaphor based models it is intended to be memorable and to act as a visual tool, enabling productive discussion and debate about the sources of uncertainty at each stage of a project’s lifecycle. Like all metaphors it is an imperfect approximation for reality, but one that is intended to open up fresh ways of seeing project uncertainty. After all the very purpose of a kaleidoscope is to be shaken to make new patterns, in contrast to projects, which in an ideal world would remain stable and not subject to violent perturbation! In spite of this limitation, we believe that using the Uncertainty Kaleidoscope to explicitly identify, characterise and debate uncertainty may increase project managers’ confidence in addressing the uncertainties with which they are confronted. As a minimum it should enable areas of uncertainty to be identified and explored, rather than ignored or overlooked. As an added benefit it may also lead to a gradual change in perspective from uncertainty as risky, problematic and something to be feared, to uncertainties as potential opportunities, from which the project may exploit and profit. 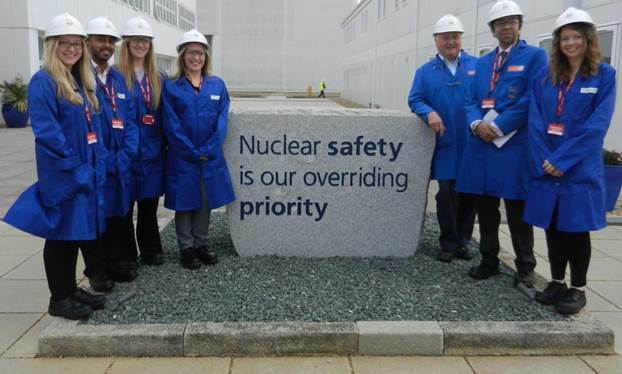 Gaining research access to safety-critical projects can be difficult due to the high levels of commercial sensitivity that prevail in these industries. This study of nine safety-critical projects provided a valuable opportunity to explore these under-researched project environments, and has enabled us to develop the Uncertainty Kaleidoscope as a model for mapping the determinants of project uncertainty in safety-critical projects. Our next step is to understand how these uncertainties emerge, are analysed and acted upon by project management practitioners in these complex and highly consequential projects.